This is me Sarah mum of 3: Favourite Childhood toys. We all have them don't we, the ones that have stood the test of time, the ones that we remember being a firm fixture to our childhood, so when Mummy Too said she was doing a linky all about Favourite Childhood Toys I really wanted to join in. 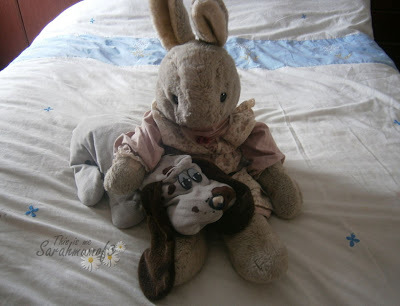 I have two soft toys that I remember being there all through my childhood, they were still on my bed in my teenage years and continue to have that spot right to this day. Not your ordinary teddy bear or girls doll, but instead a beautiful rabbit and a Pound Puppy. I remember the day I received both of these toys, Wrinkles, the Pound Puppy, when I was probably no more than 3 or 4 years old, and Pound Puppies were all the rage, me and my sister already had one or two of the smaller versions when the pregnant Mummy Puppies had just been released and they became high up on our wish list. Any trip to town resulted in me having a major tantrum because I couldn't come home with one. (and I get reminded of this often especially when my own strong willed children play up!) 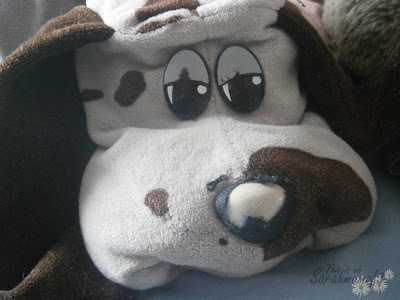 Anyway eventually me and my sister got our very own mummy and babies Pound Puppies and Wrinkles was named and instantly become a favourite toy who never went too far away from my side from that point on. 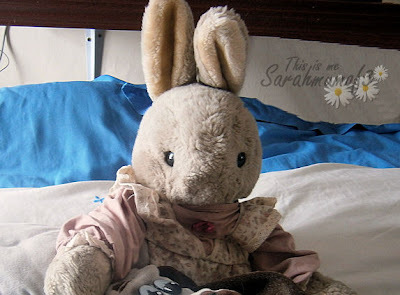 Unfortunately her babies got lost along the way, but other than her scuffed nose, which has been lovingly rubbed off, she is still very huggable along with her partner in Crime Magic the Rabbit. I received Magic as a Christmas gift, a year or two after Wrinkles. That Christmas is the one stored most highly in my memories, that year me and my sister walked down the stairs on Christmas morning eager to see what Santa had left us with butterflies in our stomachs, and on opening the living room door we were greeted with beautifully wrapped presents, but amongst the pretty wrapping paper my sister had a lovely wooden rocking horse unwrapped proudly on display, and I had Magic the rabbit, sitting unwrapped on top of a big box, from the moment I set eyes on her I loved her, she doesn't always sit up as well these days as her stuffing is somewhat less firm from all the hugs, and her dress isn't as pressed and primed as it once was, but I still love her as much as I did that Christmas morning. Both Magic and Wrinkles accompanied us on all our family holidays and sleepovers at grandparents, they were the subject of hours of entertainment as they attended all sorts of tea parties and put up with being hugged, sat on and left behind on numerous occasions. With them being such a huge part of my childhood I looked for a photograph of Magic and Wrinkles with me as a child, thinking surely there must be hundreds of them somewhere, but in the selection of photographs I have I couldn't find a single one of me with them, granted I don't have many of my childhood photos, they are all stored in my mums loft, but I was hoping for a glimpse of Magic and Wrinkles amongst my collection somewhere. Then I found this one, it is of my bedroom, when I would have been a young teenager, crazy about Boyzone and there you can see Magic and Wrinkles in their favourite position on my bed. 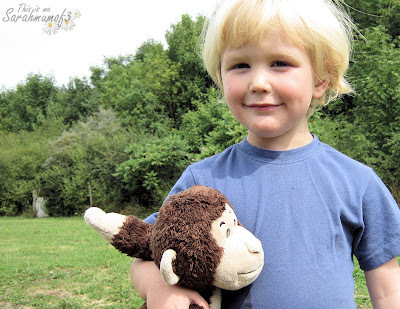 The lack of photographs of me with my much loved toys which really do symbolise childhood made me wonder if I had any of my children with their favourite toys. 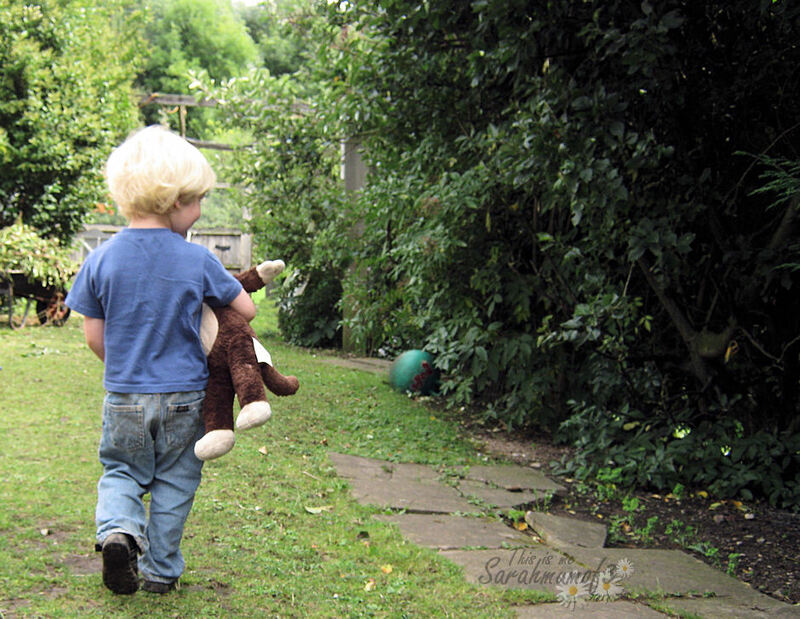 I found some lovely ones of my youngest with his favourite Monkey - Fred taken a couple of years ago and some of the older two with various favourite toys, but surprisingly there is a distinct lack of their furry friends and it will be something I shall try to remember to photograph from now on, so when they look back in years to come they will find the photos to match their childhood memories. 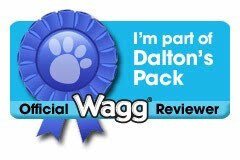 I am linking this up to Mummy Toos Linky, be sure to pop over to see everyone elses favourite Childhood toys and join in showing off your own by following this rather lovely badge! I had that SAME pound puppy in the 80s!!!! Grey with brown spots. Lovely story - love the pictures too! 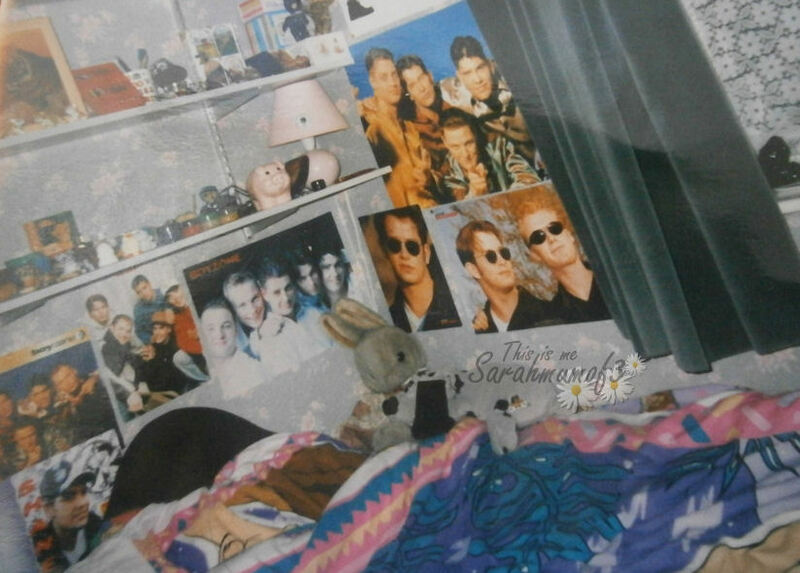 Love the teenage bedroom picture.